Mathew: This was great! Solid story, funny, fast-paced action and beautiful to look at. Another home run for Pixar! Woot! Helm: I enjoyed it and I agree it is worth seeing. But I think I enjoyed it just a bit less than you did. Mathew: WHAT?! I was in the theater with you! I heard you chortling away! When that dude flipped his kilt up and mooned those other dudes! Hilarious! Mathew: Something off in the metaphoric thrust of the story? What the hell are you talking about? Metaphoric thrust?! It was awesome! Mathew: But? What's up with the but? Helm: Let me ask you the same question. I thought you were supposed to be on a new diet and slimming that enormous bean cannon of yours. Mathew: Don't change the subject, Helm! What exactly did you think was wrong with the movie? Helm: I did not think anything was wrong with it as much as I felt that, perhaps, slightly more could have been right with it. Mathew: Okay. You sound like some totally stupid film critic. Helm: I did not realize I sounded anything like you. Mathew: No. You're the stupid one. Seriously! This film was really good! Why do you want to rank on it? Is it just because it featured a story built around the complex relationship between a mother and her headstrong daughter? Did it threaten your manhood? Helm: Nothing threatens my manhood! I am the helm of the Valhalladrim! Mathew: Oooooh. Hit a nerve, did I? Helm: You hit nothing! Which is much like your performance in battle. I was not threatened by the use of female characters. I was bothered that the powerful and resonant metaphors the filmmakers used to convey the story did not always seem to mesh as perfectly and tightly as in previous Pixar films. 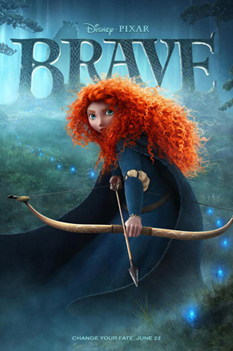 I wept as a babe during the films Up and Toy Story Three, but I was not as moved by Brave. This is not to say that the film is weak! It is not! But neither is it as strong as the best that has been delivered unto us by Pixar. Mathew: Dude, you're starting to go all "ye-olde-English" again. Helm: That does not invalidate my point. I think people should see this film, but they would be better served if they went in with expectations set just a tad lower than usual. Helm: And you are under-thinking it, a chronic shortcoming with you. Mathew: I'll give you a chronic shortcoming you dumb metal hat! Helm: I would like to see you try. Mathew: Great! Bring it, you-- AAAAARRRRRRGGHHHHHH! AHHHHHH! NOOOOOO! STOP! Helm: I thought you asked me to bring it? I am bringing it.